In simple terms, Green Chemistry is maintaining environmentally sound practices through the lifecycle of a chemical product (design, manufacture, use and ultimate disposal) and processes. While this branch of chemistry is relatively new, there have been many reports done over recent years on environmentally safe practices in the laboratory. Maintaining and designing new chemical products and processes to reduce intrinsic hazards. Green Chemistry does not aim to aid in remediation (the clean-up of pollution). Instead, the goal is to create products that never contribute to pollution through specially designed chemicals. According to the EPA, “Most remediation activities do not involve green chemistry. Remediation removes hazardous materials from the environment; on the other hand, green chemistry keeps the hazardous materials out of the environment in the first place. 1. 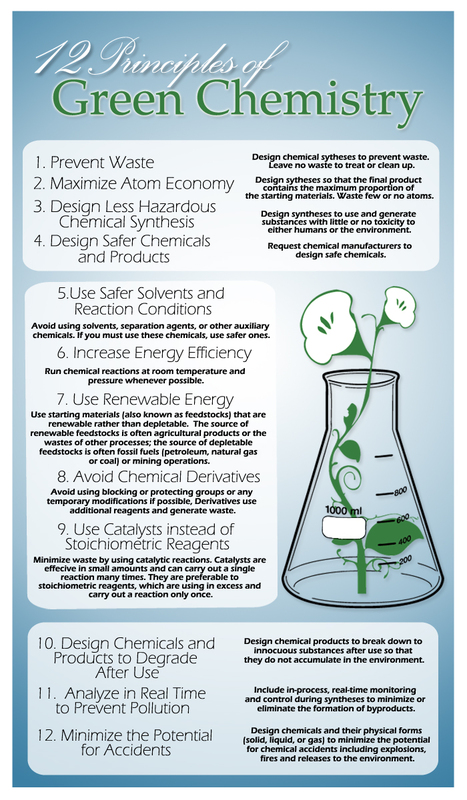 Prevent waste: Design chemical syntheses to prevent waste. Leave no waste to treat or clean up. 2. Maximize atom economy: Design syntheses so that the final product contains the maximum proportion of the starting materials. Waste few or no atoms. 3. Design less hazardous chemical syntheses: Design syntheses to use and generate substance with little or no toxic either humans or the environment. 4. Design safer chemicals and products: Design chemical products that are fully effective yet have little or no toxicity. 5. Use safer solvents and reaction conditions: Avoid using solvents, separation agents or other auxiliary chemicals. If you must use these chemicals, use safer ones. 6. Increase energy efficiency: Run chemical reactions at room temperature and pressure whenever possible. 7. Use renewable feedstocks: Use starting materials (also known as feedstocks) that are renewable rather than depletable. The source of renewable feedstocks is often agricultural products of the wastes of other processes; the source of depletable is often fossil fuels (petroleum, natural gas, or coal) or mining operations. 8. Avoid chemical derivatives: Avoid using blocking or protecting groups or any temporary modifications if possible. Derivatives use additional reagents and generate waste. 9. Use catalysts, not stoichiometric reagents: Minimize waste by using catalytic reactions. Catalysts are effective in small amounts and can carry out a single reaction many times. They are preferable to stoichiometric reagents, which are used in excess and carry out a reaction only once. 11. 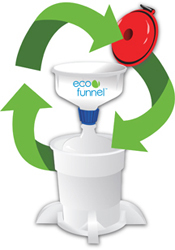 Analyze in real time to prevent pollution: Include in-process, real-time monitoring and control during syntheses to minimize or eliminate the formation of byproducts. 12. Minimize the potential for accidents: Design chemicals and their physical forms (solid, liquid or gas) to minimize the potential for chemical accidents including explosions, fires and releases to the environment.